On Sunday, a ground-based interceptor fired from Vandenberg Air Force Base destroyed a mock enemy warhead launched from the Marshall Islands. The Pentagon hailed it as a major success for the troubled national missile defense system, which has cost $40 billion since 2004. But, in truth, it changes little. As I previously wrote, the U.S. Ground-Based Midcourse Defense (GMD) system has been plagued by mismanagement and design flaws since the Bush administration decided to rush it into development ten years ago. The National Academy of Sciences' National Research Council published a 260-page study, saying that the U.S. Missile Defense Agency's efforts "have spawned an almost 'hobby shop' approach, with many false starts on poorly analyzed concepts." 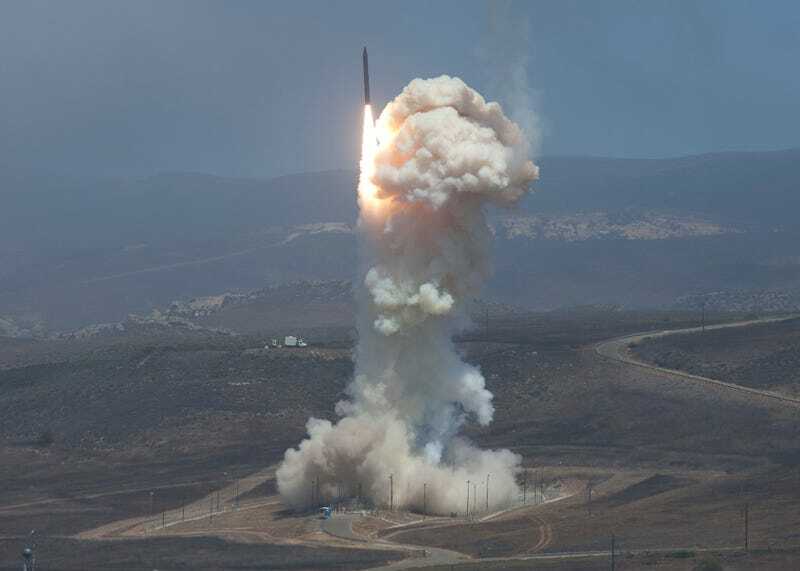 Yet, despite numerous failed tests, the U.S. spent billions deploying 30 interceptor missiles at Fort Greeley, Alaska, and Vandenberg Air Force Base, California. The Pentagon says it plans to deploy another 14 interceptors in Alaska by 2017. Meanwhile, Congress has authorized funding for a third site on the East Coast. To date, one of the most problematic elements of the GMD system has been the Exoatmospheric Kill Vehicle (EKV), which is mounted on the interceptors. The EKV is supposed to detach, detect and destroy the incoming threat by flying into space and striking the target missile at velocities approaching 22,000 mph. The EKV that was tested on Sunday—the first test since 2008—is called the CE-II, and was designed to correct flaws with the earlier iteration, the CE-I. This was a "scripted test" (what critics sometimes call "a strapped-down chicken"). Specialists operating the system knew the target warhead's exact dimensions, expected trajectory, speed and time of launch — information they would not have in the event of an actual missile attack. In real life, the challenges of hitting a bullet with a bullet—especially if the incoming missile deploys any of the myriad types of decoys and countermeasures—remain formidable. Prior to Sunday, 8 of the 16 tests have ended in failure. The CE-II has been tested only twice before, and missed both times. So, the test record is one-for-three. "Batting .333 may be great in baseball, but against nuclear-tipped missiles it is simply inadequate," writes Tom Collina of the Arms Control Association. As the Government Accountability Office pointed out earlier this month, the system is still a prototype: "There's a whole series of tests to fully prove out the [CE-II] capability that go into the early 2020s as planned. So, we're still just in the early stages of proving this thing out." Despite the fact that the CE-II remains in the prototype phase, with a one-in-three record and tested under controlled conditions, the government will continue deploying it. Ten of the interceptors currently in place carry the CE-II. The other 20 are fitted with the earlier version and will have to be replaced. Plus, the Pentagon will be purchasing and deploying 14 additional interceptors, at an additional cost of around $1 billion. The same people responsible for screwing-up this project over the last ten years are the same ones who will be entrusted with fixing it. And, if you're placing your hopes on Congressional oversight of the program, forget it. As the Los Angeles Times recently reported: "Despite GMD's problems, influential members of Congress have protected its funding and are pushing to add silos and interceptors in the Eastern U.S. at a potential cost of billions of dollars. Boeing Co. manages the system for the Pentagon. Raytheon Co. manufactures the kill vehicles. Thousands of jobs in five states, mostly in Alabama and Arizona, depend directly or indirectly on the program." And, those interceptor launch sites bring money into the states that house the bases. Right now, they're popping champagne corks in Huntsville, Alabama and at Fort Greely, Alaska. Rather than continue to throw good money after bad, critics of the current GMD system are advocating a redesign. Philip Coyle, the former Director of Operational Test and Evaluation at the Department of Defense, issued a statement saying, "We need to make sure we have a system that works, not expand a system we know to be deeply flawed."